Emergency workers called off yesterday the search for a single-engine airplane and two men who had been missing off Molokai's North Shore since Thursday night. 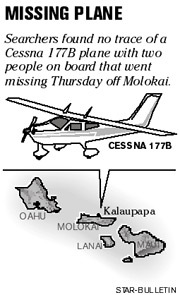 The Coast Guard, Maui Fire Department and Civil Air Patrol searched for signs of the Cessna 177B until 10 a.m. yesterday before suspending the search, said Coast Guard spokesman Brendon Ritz. Because of the direction of the wind and the location of the Kalaupapa Peninsula in relation to the plane's last known location, searchers believe any remnants of the plane that float would come ashore on Molokai, Ritz said. "It's pretty firm where the plane went down, based on radar and a witness," he said. National Parks Service employees on the Kalaupapa Peninsula are expected to check the shoreline over coming days, Ritz said. The plane, owned by Anderson Aviation Inc. of Honolulu, rapidly lost altitude before it last appeared on radar at 8:54 p.m. Thursday, according to Navy radar data. The plane's last known location was about five miles east of Molokai's Kalaupapa Peninsula and about a mile offshore, said Nicole Charnon, National Transportation Safety Board investigator. Anderson Aviation owner Kelly Anderson refused yesterday to identify the commercial pilot and commercial pilot student aboard the plane. "It's a little too soon for the families," Anderson said last night. He said the instructor, who had been with the company since May 2004, and the trainee are both men in their 20s who live on Oahu. Anderson said his company has stopped flying and will resume operations tomorrow. Coast Guard spokesman Ritz said emergency workers searched for the plane and men for a total of 30 hours by air and 30 hours by water.